Eutrophication (pronounced you-tro-fi-KAY-shun) is a natural process that occurs in an aging lake or pond as that body of water gradually builds up its concentration of plant nutrients. Cultural or artificial eutrophication occurs when human activity introduces increased amounts of these nutrients, which speed up plant growth and eventually choke the lake of all of its animal life. In nature, eutrophication is a common phenomenon in freshwater ecosystems and is really a part of the normal aging process of many lakes and ponds. Some never experience it because of a lack of warmth and light, but many do. Over time, these bodies of freshwater change in terms of how productive or fertile they are. While this is different for each lake or pond, those that are naturally fed rich nutrients from a stream or river or some other natural source are described as "eutrophic," meaning they are nutrient-rich and therefore abundant in plant and animal life. Eutrophication is not necessarily harmful or bad, and the word itself is often translated from the Greek as meaning "well nourished" or "good food." However, eutrophication can be speeded up artificially, and then the lake and its inhabitants eventually suffer as the input of nutrients increases far beyond what the natural capacity of the lake should be. Algae: Single-celled or multicellular plants or plantlike organisms that contain chlorophyll, thus making their own food by photosynthesis. Algae grow mainly in water. Nitrate: A salt or ester of nitric acid, which is a transparent corrosive liquid composed of nitrogen, hydrogen, and oxygen. Phosphate: A salt or ester of a phosphoric acid, which is any of three acids that are formed when the oxide of phosphorus reacts with water. 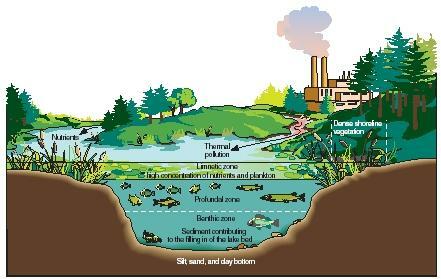 Natural eutrophication is usually a fairly slow and gradual process, occurring over a period of many centuries. It occurs naturally when for some reason, production and consumption within the lake do not cancel each other out and the lake slowly becomes overfertilized. While not rare in nature, it does not happen frequently or quickly. However, artificial or human-caused eutrophication has become so common that the word eutrophication by itself has come to mean a very harmful increase and acceleration of nutrients. It is as if something receives too much fertilizer or has too much of what is a good thing. Human activities almost always result in the creation of waste, and many of these waste products often contain nitrates and phosphates. Nitrates are a compound of nitrogen, and most are produced by bacteria. Phosphates are phosphorous compounds. Both nitrates and phosphates are absorbed by plants and are needed for growth. However, the human use of detergents and chemical fertilizers has greatly increased the amount of nitrates and phosphates that are washed into our lakes and ponds. When this occurs in a sufficient quantity, they act like fertilizer for plants and algae and speed up their rate of growth. Algae are a group of plantlike organisms that live in water and can make their own food through photosynthesis (using sunlight to make food from simple chemicals). When additional phosphates are added to a body of water, the plants begin to grow explosively and algae takes off or "blooms." In the process, the plants and algae consume greater amounts of oxygen in the water, robbing fish and other species of necessary oxygen. consuming even more oxygen in the process. The bacteria then release more phosphates back into the water, which feed more algae. As levels of oxygen in the body of water become lower, species such as fish and mollusks literally suffocate to death. Eventually, the lake or pond begins to fill in and starts to be choked with plant growth. As the plants die and turn to sediment that sinks, the lake bottom starts to rise. The waters grow shallower and finally the body of water is filled completely and disappears. This also can happen to wetlands, which are already shallow. Eventually, there are shrubs growing where a body of water used to be. In the 1960s and 1970s, Lake Erie was the most publicized example of eutrophication. Called a "dead lake," the smallest and shallowest of the five Great Lakes was swamped for decades with nutrients from heavily developed agricultural and urban lands. As a result, plant and algae growth choked out most other species living in the lake, and left the beaches unusable due to the smell of decaying algae that washed up on the shores. New pollution controls for sewage treatment plants and agricultural methods by the United States and Canada led to drastic reductions in the amount of nutrients entering the lake. Forty years later, while still not totally free of pollutants and nutrients, Lake Erie is again a biologically thriving lake. Who wrote this article? It is very helpful for my scienc fair project. Fantastic information....great help for an essay i thought was going to be really tricky!! but i guess not! thanx for the info and picture i really needed some 1 2 give a good definition!!! Wow! This really helped me with my homework a lot! thanks so much! This is like so much wonderful. I'm going to copy it and turned it in for an sicience experiment! this was good=).My teecher sugested this sit too me. this is clear and comprehensible information on eutrophication as a consequence of loss of our valuable wetlands.bravo ! Excellent work!... It really makes me to do the project easily and effective.The teacher appreciates me eventhough I submitted it late. This article is very concise and lucid. Kudos to this article! Excellent info, but where is this info coming from, a reference of sources would be great! this article help me a lot . i like this article thank for put this in website. Thanks! Great help with my chemistry assignment on water pollution! It's simple and interesting.I would like to know more about the other articles published by the author.Thank U.
i love this website so much because it helps me a whole bunce for me and my nstudents. thank you. i love you. I basically agree with everyone else here. I am doing a sophomore project in college. One significant issue I have recognized is that eutrophication is happening world-wide. This is beyond alarming to me. This should also eencourage us all to be more susutainable and look to improve this scary situation. What does this algae do to the ecosystem? Pollute drinking water, take away swimming as a recreational activity, and add more aquatic species to the endangered list? Great article. Provided all the information I needed in a concise and simple fashion. Really helped me with my environmental science project. 1. How long had eutrophication been going on for? 2. Have you heard about eutrophication in Lake Peipus? 3. Is eutrophication hard to see? 4. How long have we known about eutrophication? 5. Do animals die from eutrophication? This is an excellent article. I gained a better understanding of eutrophication for my science report. Thanks for posting this and explaining it very thoroughly! I realy like this article.It helped me in my studies. Hey, thanks so much you have been a tremendous help. No really! I have been searching for a while now for some real answers about Eutrophication. Now that I have read this article, I would think that a professional writer had wrote this. You really don't know how much I am greatful for the time you had to write this. I needed it for an assignment in science for homework. Thank you so much again. I hope you enjoy all of the knowledge you have and will to come. THANKS AGAIN ! ! ! Wow, THIS IS fantastic! This really helped me with one of my CP Bio labs. Thanks so much. this article is really agreat help for the students because it complements the lacking information that the students should know. it helps me in making my term papers..thank you so much.. This article was very useful in me completing my Biology assignment, so cheers to whoever wrote it. Awesome, helped me nailed my EDEXCEL unit 4 as a side effect of enhancing food production to decrease food insecurity. Thank you for this article. I have to write a paper about cultural eutrophication for my A.P. Bio class and this is a great help! Awesome and wonderful,this Article had helped me completed my BIO Lab Write up.. This is a good article.We should remember it and use it. that I have just typed in please thank you I would appreciate it. Very helpful information for my science essay. thanks to whoever wrote it! thank you so much,that's really helpful, my science essay finally found some strong sourse. What are the consequences of artificial eutrophication? Hi Im Curtis i can say im in the 9th grade and this helped me out alot. Thank you! I am so grateful to the person who wrote this. The information is clear. Thanks alot! Well, science clarified lives up to its name. Science that is clarified! Wow this is very helpful and I learn a lot to this article ,it give me fantastic information Thank you for this.